Larry has been a TV/Film writer for over 35 years. He won the W.G.A Award for Seinfeld and was nominated for two Emmys. His career has spanned almost every facet of media, writing half hour comedies, hour dramas, features, TV movies and animation. He believes in passing on what he has learned, and thus, he has recently been teaching TV writing as an adjunct professor at the LMU School of Television and Film and has been enjoying that very much. Larry just wrote his first novel and sold it to Random House/Broadway Books. 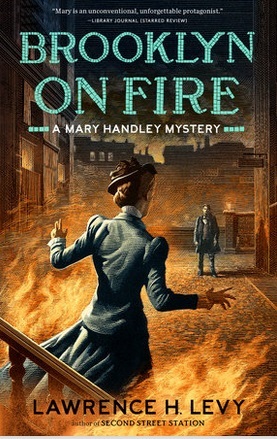 It’s based on the true story of Mary Handley, a young woman in late 19th century Brooklyn who was hired by the Brooklyn Police Department, when there were no policewomen, to sleuth a high profile murder. American icons such as Thomas Edison, J.P. Morgan, Nikola Tesla and many others are involved and we learn little known facts about them. 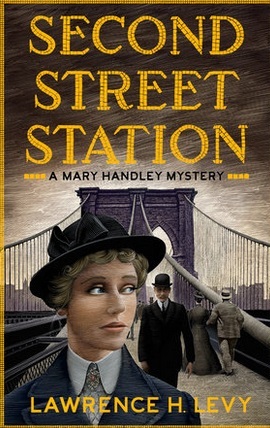 Second Street Station was released this summer and the sequel, Brooklyn On Fire, will be out on January 19, 2016. Two things come immediately to mind: family and writing and in that order. I’ve been married for 38 years and have two children who are grown and out in the world right now. I am proud to say they are thriving and that gives me great pleasure. To me, my family always comes first, and I like to think I’ve been pretty good as a husband and father. I’ve had some great success as a writer and sometimes it can be an obsession. When I’m in the middle of a story I feel passionate about, I’ve been known to write 13, 14 hours a day, 7 days a week. That’s how it was with my novels and truly any story that has really grabbed me. That is when I write best, because that passion invariably shows on the page. If I ever start thinking I’m the best, then I know it’s time to quit. That kind of ego can destroy the creative process. I can’t discount my W.G. A. Award for Seinfeld or my two Emmy nominations. Those were fun. However, starting a new chapter in my career as a novelist at my age and having four major publishing companies wanting to buy my book was an incredible ride, so I’ll choose that. Of course, my daughter, Erin, winning a Writers Guild Award for Mad Men, making us the only father and daughter who have both won Writers Guild Awards was also pretty darn special. P.S. She also won an Emmy. I want to keep writing and producing good work. I’m not the type of person who can be satisfied with playing golf all week like some of my friends. I guess that was telling my parents that I wanted to go into the arts. I was a graduate of Cornell and came from a family of lawyers. A career in the arts was unheard of. However, they were very good about it. Write what you truly believe in and are passionate about and forget trying to figure out whether it’s commercial. My Prius. Love that gas mileage! TV binge watching, movies, traveling and of course, my latest novel.